1757-98. He was born of Dutch descent on 22 June 1757 at Kings Lynn, Norfolk, the sixth son of a customs official John Jasper Vancouver, and of his wife Bridget Berners. Vancouver entered the service as an able seaman aboard the Resolution, Captain James Cook, participating in the Yorkshireman’s second voyage of exploration from 1772-5, and he later joined the Discovery under the same officer on his last voyage which left England in 1776. Following Cook’s murder at Hawaii on 14 February 1779 the Discovery returned to England in October 1780. On 19 October 1780, just two weeks after his return to England, Vancouver passed his lieutenant’s examination and received his commission, and on 9 December he joined the sloop Martin 14, Commander William Wardlaw, seeing duty in the North Sea on the lookout for French and Dutch privateers before sailing for the Leeward Islands in February 1782. Shortly after the Battle of the Saintes on 12 April he removed to the Fame 74, Captain Robert Barbor, which vessel returned to England in the summer of 1783. In 1784 Vancouver joined the Europa 50, Captain Edward Tyrell Smith, and from October Captain Richard Fisher, which served as the flagship at Jamaica to Rear-Admiral Alexander Innes, and which from 1786 flew the broad pennant of the commander-in-chief, Commodore Alan Gardner. The Europa eventually returned home to be paid off in September 1789. 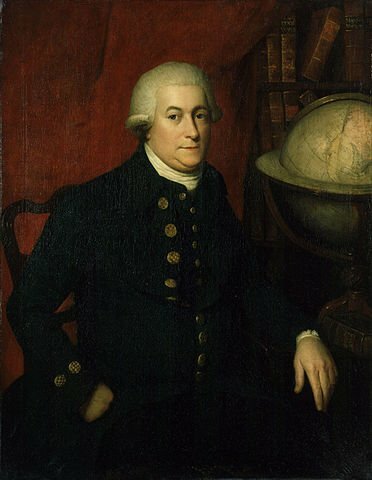 When he learned that an expedition was preparing to sail on a voyage of exploration to the northern west coast of the Americas, Gardner recommended Vancouver for the position of second-in-command to Captain Henry Roberts. Vancouver assisted in the fitting out of a newly purchased vessel named the Discovery, but the Spanish Armament of 1790 prevented the sailing of the expedition and the Discovery’s crew were dispersed amongst the under-manned fleet. Vancouver was himself appointed to the Courageux 74, Commodore Alan Gardner, and when this vessel was paid off he was promoted commander on 15 December. With the Spanish crisis now settled Vancouver was selected at Gardner’s instigation to take possession of Nookta Sound, the anchorage on the north-western coast of America which had been the cause of the dispute, and this he did during a lengthy voyage of exploration from 1791-5. Commanding the Discovery, he initially sailed in company with the Chatham, Lieutenant William Broughton, having a collection of young gentlemen of influence aboard. During his voyage he visited the Canary Islands, the Cape, Australia, Tahiti, the Sandwich Islands and the North American Pacific coast, and Vancouver Island was named in his honour, with Puget Sound being named after one of his lieutenants. On 28 August 1792 he officially received Nookta Sound from the Spanish commandant, and after a further tour of the northern Pacific he returned home via Mexico, the Galapagos Islands, and Chile to reach England in September 1795. In the interim Vancouver had been posted captain on 28 August 1794, and he now retired to his house at Petersham, Surrey, to write up his journal for publication. On 21 September 1796 he was subjected to the infamous ‘Caneing in Conduit Street’ by the impetuous Lord Camelford who had long harboured a grudge towards Vancouver over the captain’s perceived harsh behaviour towards him whilst Camelford was a midshipman aboard the Discovery. Sadly the disagreement with Camelford, who was a member of the hugely influential Pitt family, contributed to Vancouver’s continued ill health and he died at Petersham on 10 May 1798 before his work could be completed. He was buried in St. Peter’s Church, Petersham. His brother, John, in company with the promoted Captain Peter Puget, eventually ensured the completion and publication of Vancouver’s work a few months after his death. His London address was 142 Bond Street, London, and he also had his residence at Petersham in Surrey. Vancouver was accused of applying a tyrannical discipline during his long voyage around the world, and his ship was clearly not a happy one. He was described as ‘haughty, proud, mean and insolent’, notwithstanding the fact that his most prominent detractor was the notorious rake Lord Camelford, whom he had beaten three times with some justification before throwing him off the Discovery, and whose grudge towards Vancouver was supported by the additional weight of the influential Pitt family. There was little doubt that he had a quick temper, and he expected his own high standards to be met by his subordinates. Certainly his midshipmen lived in fear of his rages, and many of them felt that he had been too harsh with Camelford. Even so, he was admired by most of his officers for his many positive attributes.